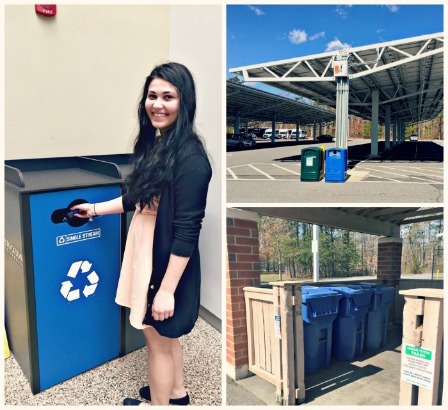 At Stockton University, you can find a pair of recycling and trash bins everywhere you look – from the outskirts of the parking lot to recreational areas, the cafeteria and even in students’ dorm rooms. Known as New Jersey’s Green University, separating recycling from trash at Stockton has been commonplace for years. Yet, even the most environmentally conscious school continually looks for ways to improve its program. The university is currently competing in RecycleMania, an 8-week recycling competition among national college campuses. The competition provides an opportunity to remind students and faculty about the materials accepted in single-stream recycling. “We thought it would be a great way to keep the faculty, staff and students excited about contributing to the ‘green’ culture,” said Darnley Biddle, Administrative Assistant to the Facilities Management and Plant Operations Department, which carries out the initiative. Left: Plant Operations Department responsible for recycling on campus. Right: Various recycling and trash bins around campus. Students were notified about the competition through email and electronic signs on campus in a decisive effort to save paper. When bins start filling up, employees from the Plant Operations Department gather materials from the many locations around campus in easy-to-maneuver 95-gallon carts. Students are responsible for transporting recyclables from their dorm rooms to carts located in outdoor corrals. The carts are then emptied into Stockton’s own compressed natural gas (CNG) recycling truck, which delivers materials to ACUA’s Recycling Center. When the truck takes material to ACUA, it is weighed and the tons are later reported to the competition. 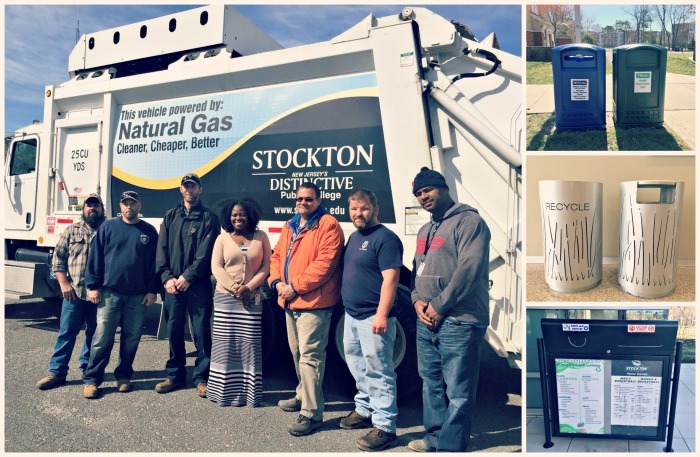 Stockton proves that recycling on a large-scale is possible when you have a commitment to your program. As we note in our school and business recycling guides, it’s important to ensure key people in your organization are on board with recycling and that you continue to spread awareness over time. Because sustainability is an integral part of Stockton’s mission, they have essential buy-in from management and employees. The continual turnover among students can pose a challenge, but participating in events like the RecycleMania competition can help keep it fresh in their minds and open the doors for feedback and contribution. Left: Student Mackenzie Grillo recycles in the school cafeteria. Right: Recycling bins in the parking lot and waste corrals. “Students are always excited to participate and find ways to make the program better,” said Biddle. A great example of student feedback came when a group of students commented that recycling bins were too small in classrooms to sufficiently collect materials. Stockton took that feedback and provided larger bins. Does your school or business need a recycling reboot? We can help implement a program or see where it can be improved. Please contact us for assistance.